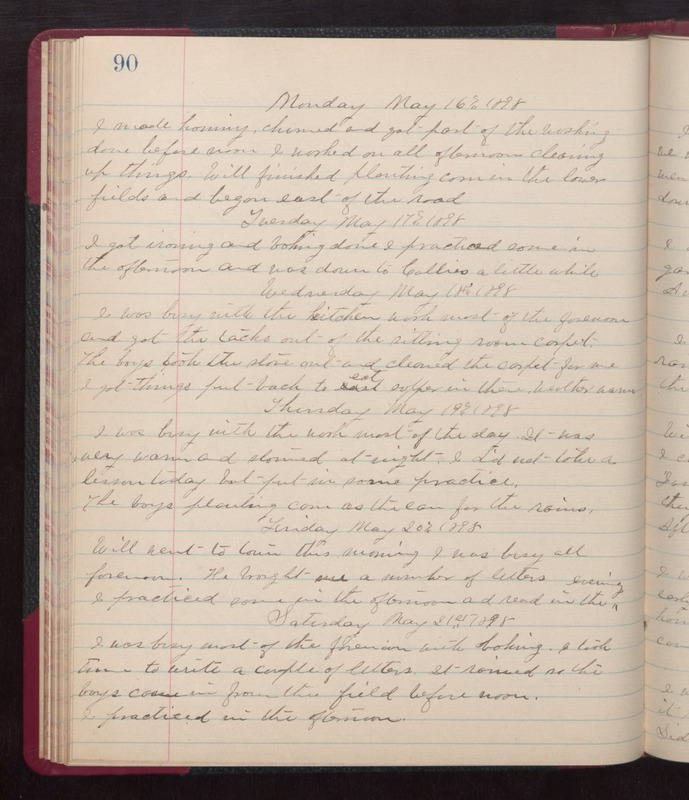 Monday May 16th 1898 I made hominey, churned and got part of the washing done before noon. I worked on all afternoon cleaning up things. Will finished planting corn in the lower fields and began east of the road. Tuesday May 17th 1898 I got ironing and baking done. I practiced some in the afternoon and was down to Callies a little awhile. Wednesday May 18th 1898 I was busy with the kitchen work most of the forenoon and got the tacks out of the sitting room carpet. The boys took the stove out and cleaned the carpet for me. I got things out back to eat supper in there. weather warm. Thursday May 19th 1898 I was busy with the work most of the day. It was very warm and stormed at night. I did not take a lesson today but put in some practice. The boys planting corn as the[y] can for the rains. Friday May 20th 1898 Will went to town this morning. I was busy all forenoon. He brought me a number of letters. I practiced some in the afternoon and read in the evening. Saturday May 21st 1898 I was busy most of the forenoon with baking. I took time to wrote a couple of letters. It rained so the boys came in from the field before noon. I practiced in the afternoon.